Julie Rivera holds a BFA in Graphic Design and Textiles from The School of the Art Institute of Chicago. Formerly an Art Director at Odesta Corporation, a top ten Macintosh software publisher, Rivera brings an extensive background in communications art and technology to publications and marketing materials. While at Odesta, she was also responsible for the company’s exhibit management including booth design. As owner of Rivera Design & Communications for over 20 years, she focuses on corporate identity, marketing materials and book design for start up companies and independent book publishers. Many of her book designs have received recognition. In addition, Rivera also focuses on surface design. Her work was chosen to be included in Valerie S. Goodwin’s book Art Quilt Maps and last fall she was a Studio Assistant to Akemi Nakano Cohn for an Indigo Master Class at Arrowmont School of Arts and Crafts. Rivera exhibits and sells her fiber art locally and through her website. 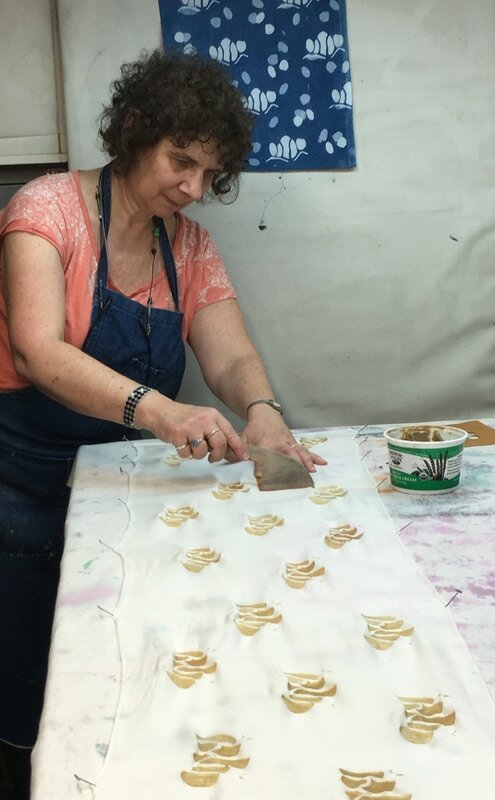 She is currently a member of Women’s Journey in Fiber and the North Suburban NeedleArts Guild, where she served on the board from 2011-2016.